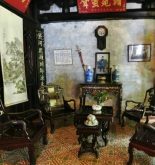 Phung Hung Ancient House is one of the most famous houses in ancient architecture and it is considered the cultural heritage of Hoi An. The house was built in 1780 and it is located at 4 Nguyen Thi Minh Khai. The host of this house is a Vietnamese businessman who was wealthy by trading. He named the house with expectation for the property of family business. The house is typical for the long tube house used for trading. In the prosperous period of Hoi An, this is the shop selling forestry specialties, silk and porcelains. The architecture of the building represents the harmonious combination between the Japanese, China and Vietnam. 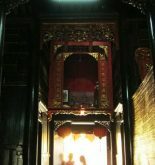 Corridor and balcony system is featured with Chinese style. The roof heading to four directions is popular image in Japan. The wooden horizontal and vertical pillars bring the color of Vietnam country. Looking at the house, visitors can recognize the house is built by plain sacred materials with few motifs in purpose to make the difference. The front roof is carved by the image of carp. The carb implies the wish for gook luck in Chinese believe, the power in Japanese culture and property in Vietnam tradition. Previously, the house used as a place to exchange and trade with commodities trading as silk, glass, pepper, salt. Now part of the house used as a workshop for small business trade. 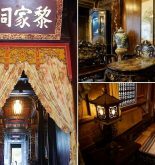 The house also contains a lot of information about the lifestyle of the merchant class in ancient trading port of Hoi An. Phung Hung Ancient House was recognized as Historical and Cultural Heritage on the 29th June 1993. Ticket: inside the Hoi An Old Town ticket.